Item # 310130 Stash Points: 795 (?) This is the number of points you get in The Zumiez Stash for purchasing this item. Stash points are redeemable for exclusive rewards only available to Zumiez Stash members. To redeem your points check out the rewards catalog on thestash.zumiez.com. Keep your hair out of your face so you can focus on being the life of the party with the Stone + Locket Party Scrunchie 3 Pack. This three pack of hair holsters features grey and silver sparkle detailing on two and is rounded out with one simplistic, all black scrunchie. 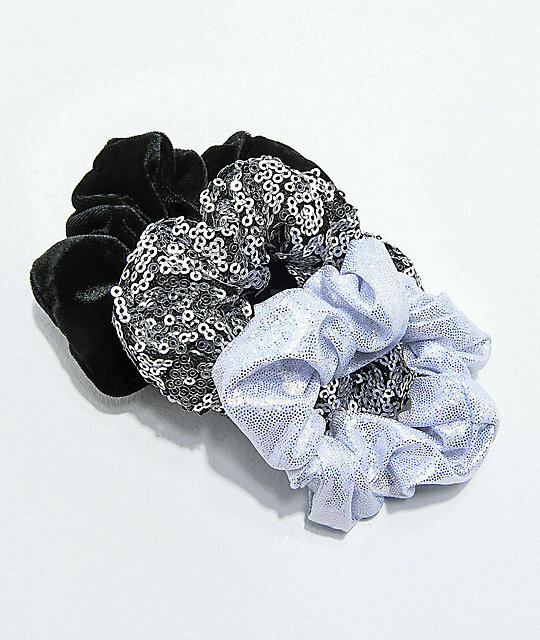 Stone + Locket Party Scrunchie 3 Pack. Colors: Grey sparkle, silver sparkle & black.